Since 2010, teams have been utilising the high heat and power of the exhaust system around the rear of the car for an aerodynamic advantage. With a lot of freedom to place the exhaust exit around the rear of the floor, Red Bull first prompted the use of exhaust gases to enhance the capabilities of the floor and diffuser area to produce more downforce. 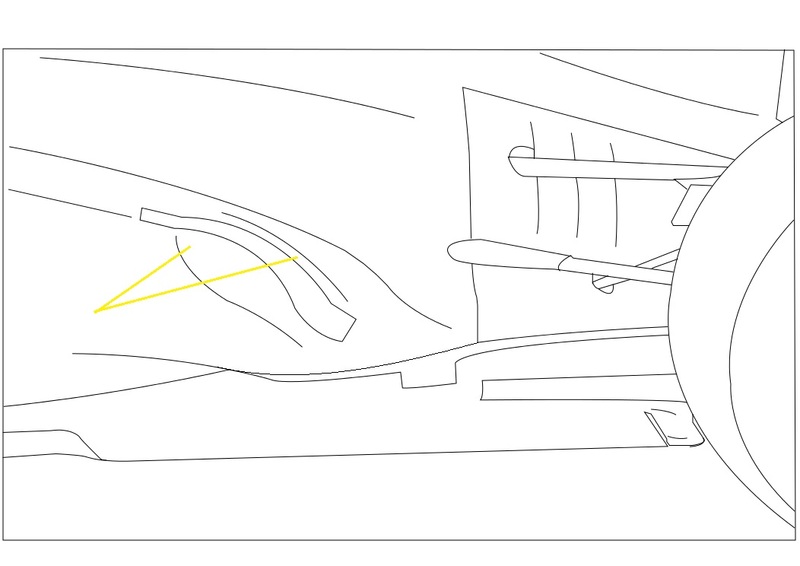 The above image shows how the exhaust plume (yellow) is projected into the diffuser area at the rear of the car, beneath the rear wishbone. This was done to create a greater pressure delta between the top side of the floor (high pressure) and the side of the floor facing the track (low pressure). The greater the difference, the better the diffuser works at extracting the low pressure from beneath the car, producing more downforce. This was the start the Exhaust Blow Diffuser (EBD) technique. In 2011, this concept was taken another step further by placing the exhaust exit directly in front of the gap between the rear tyre and the edge of the floor. The Red Bull RB7 had the most effective EBD during the 2011 season. The exhaust gases (red) travelled through the pipe beneath an aerodynamic shrouding (yellow) before exiting into the gap. This effectively “sealed” the gap, as the high velocity gases reduced the amount of low pressure airflow beneath the car escaping by the rear tyre. It also reduced the effect of tyre squirt upon the diffuser – turbulence created by the rotation of the tyre would impinge on the walls of the diffuser, reducing its efficiency. These two benefits would help extract more downforce from the rear of the car. As the 2011 season progressed, teams exploited the mapping of the Electronic Control Unit (ECU) to use a technique called “Hot Blowing”. Hot Blowing the diffuser meant that the car would continue to blow exhaust gases out of the exhaust system even when the driver was off the throttle by the retardation of the engine. This would provide the car with a consistent rear end as there was a constant supply of downforce. “Cold Blowing” refers to the use of the EBD without the capabilities of blowing the diffuser off throttle. Only the top teams could fully realise the potential of Hot Blowing the diffuser, as they worked extensively with their respective engine partners to extract as much gas from the exhaust as possible when off throttle. This basically means that the exhaust cannot be positioned along the floor and enable the use of the EBD. The FIA also restricted the ECU engine mapping that engine suppliers tune to attempt to reduce the power of the EBD even further. However, as always in F1, teams came up with new solutions to this issue. What is the Coandă effect? The definition of the Coandă effect is “the tendency of a fluid jet to be attracted to a nearby surface”, according to Wikipedia. In the context we are talking about, the fluid jet is the exhaust plume coming out of the exhaust pipe. The effect describes how the jet is attracted to a nearby surface and follows it. This can be used to describe how a ball can be suspended in the air when a jet of air is blown at its surface. Because of the regulation changes stated above, the teams have used this effect to make the exhaust gases travel to a desired destination – the rear of the floor next to the diffuser. The exhaust plume is a hot, high pressure jet of gas so it will pull to a nearby surface. This surface can then be positioned to point towards the eventual destination of the gases as the plume will travel along it. There are two methods for directing the gases to the floor which we shall be exploring in this article. The 2012 Red Bull RB8 debuted with an exhaust outlet facing upwards against the top wishbone, prompting suggestions that they would be using the aerofoil shape of the wishbone as a way of producing extra downforce when coupled with the exhaust plume’s high velocity flow. However this was soon replaced by their first iteration of the full Coandă exhaust system. The arrows demonstrate what types of flow are occurring around this region of the car. The orange arrow shows the path of the exhaust plume as it leaves the pipe. As you can see, it exits at the angle the pipe is set at before travelling sharply downwards along the ramp. This is the Coandă effect. 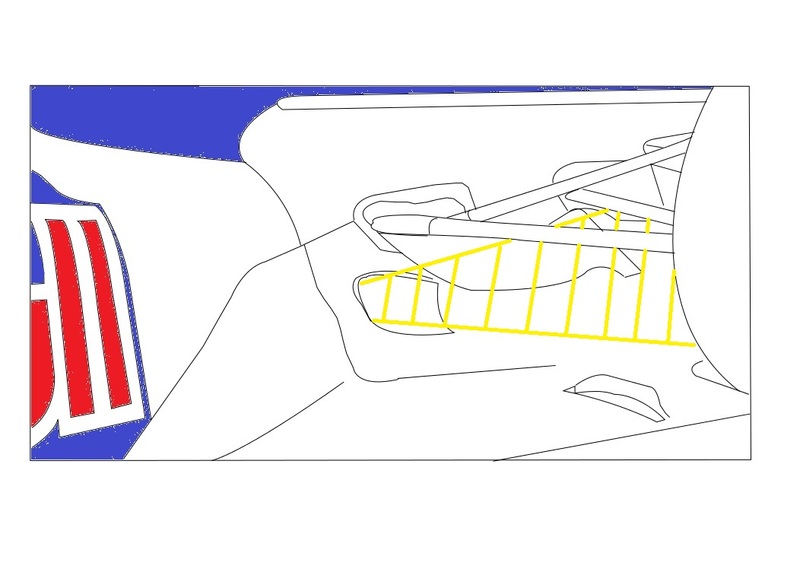 It is aided by the downwash of the airflow coming over the sidepod, making it attach to the ramp sooner. The downwash also helps the exhaust gases find their way to the edge of the diffuser. The green arrow shows the path of the airflow coming around the sidepod. It enters a tunnel beneath the ramp before exiting near the centre of the car to continue its natural path to the starter motor hole. The size of the tunnel is limited in height as well as radius, so it is quite a challenging area to design as a lot of airflow comes through this area. 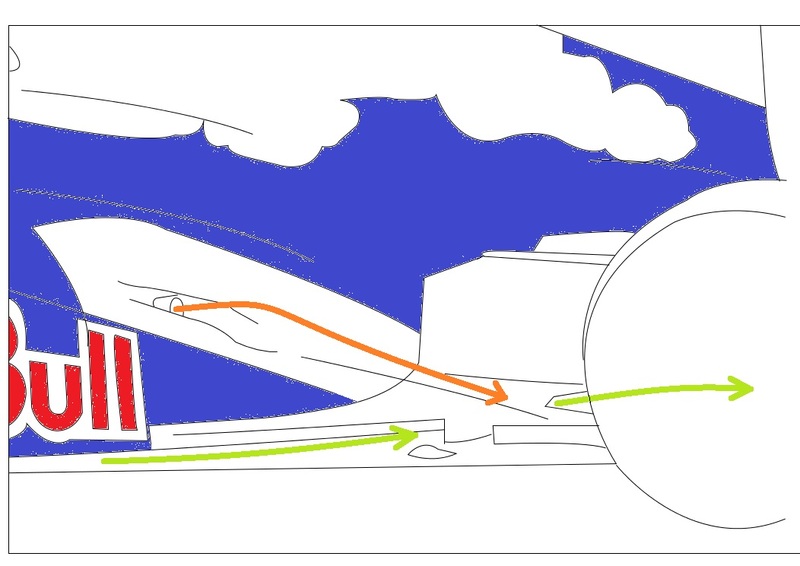 The tunnel is needed as the flow coming around the sidepod must be directed efficiently to reduce drag and also create more downforce from the rear of the car. The exhaust pipe exit is set as far back as possible to within the regulations and has quite a low angle, probably around the bare minimum of 10 degrees. You can also notice the guide fence that runs in parallel to the edge of the floor. This is to guide the exhaust gases along the side of the rear tyre before sealing the gap between it and the edge of the diffuser. Sauber produced a similar version to that seen on the Red Bull during 2012. For 2013, more teams have taken up this option such as Lotus and Toro Rosso. Williams attempted to run the system but found it too throttle sensitive, a common issue with this kind of exhaust system. If it is too throttle sensitive the rear of the car can be unpredictable as there is an on/off “switch” of downforce. This happens because the gases are fed directly into the floor rather than over a gap (which we shall look in to later), meaning that the throttle position almost completely correlates to the amount of exhaust gases emitted from the engine. This can be conquered by using different engine mapping techniques to make it more consistent and this is what teams used to do during 2011 when engine mapping had a lot more freedom. It is also coincidence that Renault engine partners tend to try to exploit this setup more than other teams running different engines. This may be because the Renault engineers have a good mapping system to make the car more driveable. However we have lately seen Toro Rosso join Sauber with the full-Coandă system, but both teams use Ferrari engines. It is interesting that Sauber reverted to a semi-Coandă system for the first half of this season before recently reverting back to a revised full-Coandă layout which they used last year. 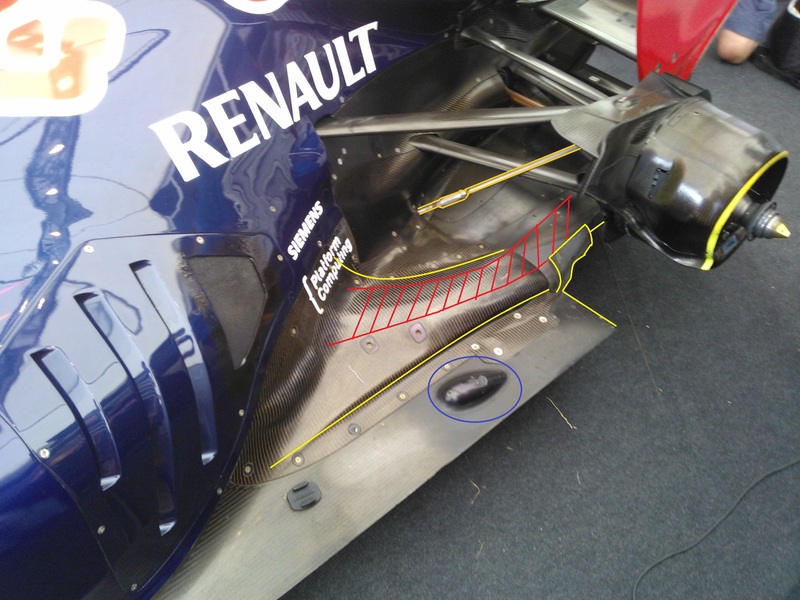 What teams have recently been doing is placing large bumps (yellow arrows) either side of the exhaust. The idea behind this is to reduce the spillage of the plume and direct it down the ramp as much as possible. The bumps also present themselves as another surface for the exhaust jet to attach to as it exits the pipe, resulting in more of the gases following on towards the rear tyre. Lotus have been exploring the use of different materials along the ramp to try to gain more of a boost out of the system. The current E21 features an alloy surface around the exhaust pipe rather than the previously used carbon fibre, as the alloy absorbs less energy from the exhaust gases. Overall the full Coandă system should produce more downforce than the semi-Coandă exhaust, which we shall come onto next. This is because the gases are fed directly along a surface to their final destination. When McLaren first launched their MP4-27 in 2012, a lot of technical analysts thought that they were trying to achieve a “blown rear wing” or something along the lines, as the launch specification car had a shrouding over the exhaust that made it look as if it were being directed upwards and outwards. However, once pre-season testing came about all was revealed. The system is composed of the exhaust pipe, housed in a trough, overhanging the rest of the bodywork, with the normal shape of the sidepod “coke-bottling” beneath it. 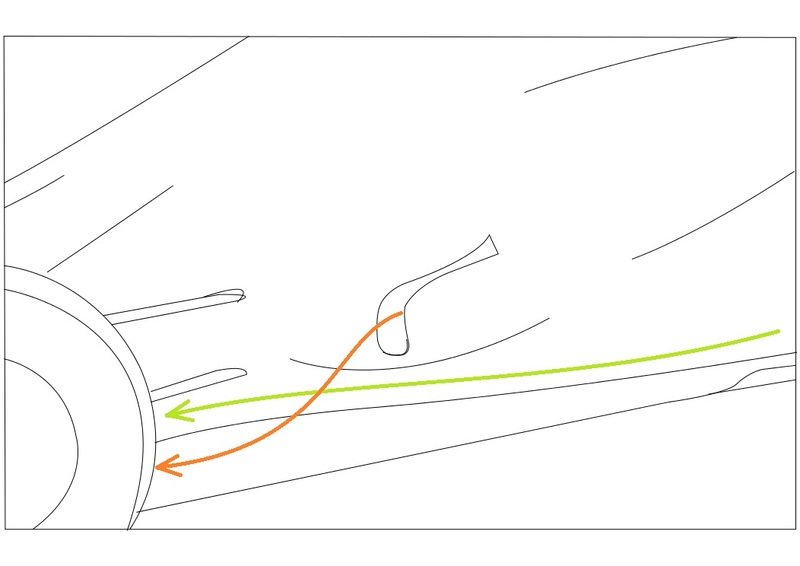 Quite simply, the exhaust plume (orange in the above diagram) attaches to the surrounding surfaces in the trough, exits over the top of the airflow passing beneath it (green) and lands on the rear of the floor. It is called a semi-Coandă exhaust because the surface that the exhaust plume attaches to does not reach the final, intended destination. It has to bridge a gap. 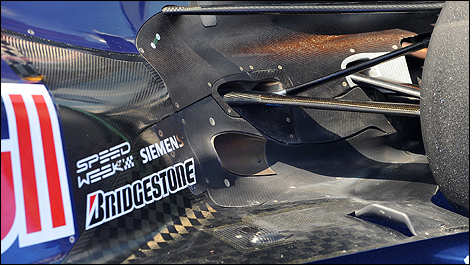 The attachment of the plume to the trough surface is aided by the downwash generated over the top of the sidepod. It is not as powerful as a full-Coandă system because the exhaust plume has to jump from the surface it is attached to to the floor below, so the exhaust gas loses some of its energy as airflow coming around the sidepod interacts with it. However there are a number of advantages to this layout and this is probably why the majority of the grid utilises this concept. It is not as throttle sensitive as the full-Coandă, as the exhaust plume is not attached to a surface the whole time. This therefore means that the car is potentially more driveable and will have a more consistent feel to the driver. Also, the tapering of the bodywork beneath the trough maximises the use of the natural flow at the base of the sidepod, allowing the flow to converge at the centre of the car near the starter motor hole. 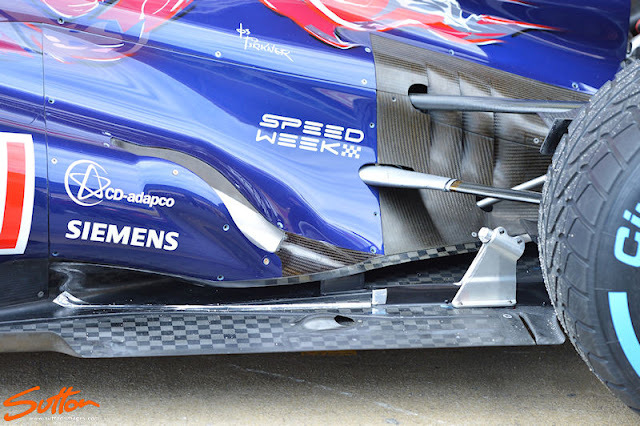 This will benefit components around the diffuser and beneath the beam wing. Cars in previous years have traditionally been exploiting this airflow, therefore installing the semi-Coandă system will not be such a compromise to the rest of the car’s aerostructures. On the contrary, because the exhaust gases lose some of their energy during the jump, this system is probably less powerful and therefore produces less downforce than the full-Coandă exhaust. It is also not as direct because it is influenced by airflow coming around the sidepod, therefore the engineers have to consider the angle that the trough is set at to counter this effect. This could potentially lead to issues with the final destination of the exhaust gases when reaching the desired area of the floor. There is also an argument that using this system compromises more engine power. Lotus experienced this when trialling their system last season. Neither system is an outright winner as each car is designed around a particular layout due to the aerostructures that have evolved from their predecessors. You could not bolt on a full-Coandă exhaust on a McLaren and expect to find any gains, as their semi-Coandă system has allowed the continuity of a large volume of airflow to travel to the central section of the car, carried over from their previous models. This is the same with any part of the car, so it is impossible to tell which concept is better. 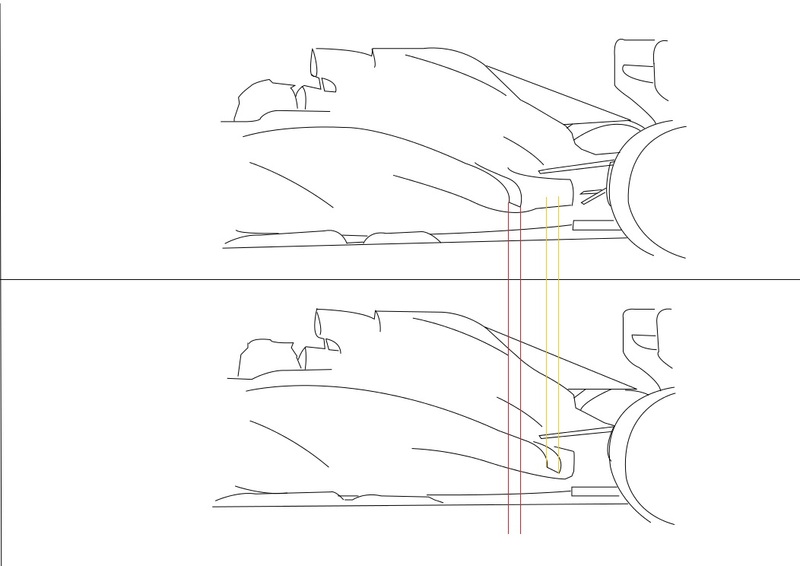 I believe (bare in mind that I am no expert) that the full-Coandă system is better at producing overall downforce as more of the exhaust plume, with a lot of energy, is fed to the desired area than the semi-Coandă system provides. This helps seal the floor much more securely, reducing low pressure leakage and the influence of tyre squirt upon the diffuser. Providing that the appropriate engine mapping is thought out by the engine supplier, the full-Coandă has more potential than the semi-Coandă – if the throttle sensitivity that comes with the layout is reduced. Both systems are also influenced by the amount of downwash over the exhaust plume as it exits the pipe. This is why we see the fences and canards placed on the sidepods and horizontally from the cockpit area. The positioning of these devices also depend on the exhaust system the car is running. Another influencing factor is not only the engine mapping, but the engine itself. The Mercedes engine is regarded as being the most powerful on the grid, which means teams running their engine can sacrifice power to produce more downforce from the exhaust. It is worth noting that no Mercedes-powered car is using the full-Coandă system and none of those teams have attempted to explore that system (yet). With the exhaust regulations changing from next year (a single exhaust pipe that must exit above the centre of the car behind the rear wheel centreline), development in this area has been slowing lately. But the evolution of this device has caused great intrigue and it is fascinating to see the innovation that the engineers come up with despite the change in regulations. This is not the end of the exhaust influencing the car’s performance. This entry was posted in Analysis, General and tagged blown, Coanda, diffuser, exhaust, red bull, semi Coanda on August 8, 2013 by thewptformula.